The Unity Reform Commission’s proposals begin the vital work of making the party more open and fair. For those who believe that the Democratic Party must become dramatically more democratic, the essential moment at the 2016 convention came when Diane Russell took the stage. A Maine state legislator and Bernie Sanders delegate, Russell delivered a passionate appeal to reform how the party nominates presidential candidates—and she outlined a plan with support from both Sanders and Hillary Clinton backers. During the primary that pitted Sanders and Clinton against one each other, Russell had advocated for doing away with the party’s superdelegate system, which for years has allowed party elders, insiders, and elected officials to cast convention votes that often go against the primary and caucus results from their states. In Maine and nationally, she had amplified the message of Sanders delegates who felt that the superdelegate system unfairly benefited the Clinton’s candidacy. At the same time, she reassured Clinton backers with a heartfelt pledge of unity and, just as importantly, a vision for getting the job done. Delegates liked what they heard. The plan—which gave the commission responsibility for going far beyond the superdelegate issue in proposing reforms for primaries and caucuses and empowering grassroots activists—was overwhelmingly approved. Along with speeches by Sanders and his backers endorsing Clinton, the establishment of the commission did much to pull the party together during a contentious convention that was rocked by allegations that DNC insiders had been biased in Clinton’s favor. The Unity Reform Commission held out a promise that the party would establish a fairer and more functional process for picking candidates. Key elements of that promise have been kept, says DNC chair Tom Perez. Reformers associated with the group Our Revolution—which pulls together many Sanders supporters and their allies—generally agree. The leader of the Sanders team on the commission, former Communication Workers of America president Larry Cohen, characterizes the reforms that have been agreed to as “large steps if not giant steps” toward putting the interests of voters ahead of party leaders when it comes to the nominating process. Our Revolution activists want to lock in the progress that has been made. With a reform proposal now in hand, they are lobbying DNC members to endorse the commission’s report and to begin implementing the changes. Sanders representatives on the commission, many of whom began as skeptics, argue that the process that began with Russell’s speech at the 2016 convention has been a real one. The 21-member commission was organized last year, held hearings, and produced a report that outlined a number of reforms. This is not a radical program for transforming a party that has always struggled to live up to its name. 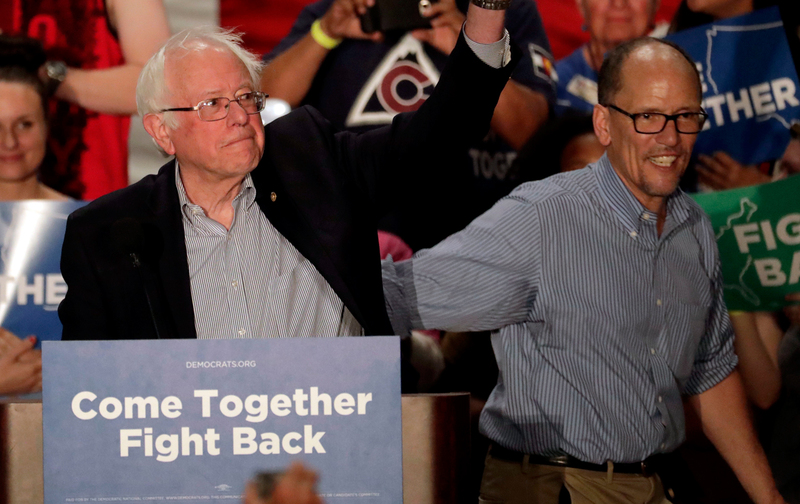 But the report does include meaningful proposals for changes that the party must make, especially when it comes to reducing the influence of superdelegates. The state parties must encourage party switching to be as easy as possible including switching on the days of the Primary and cannot use state law as justification for inaction. Litigation must be used if necessary. Currently at least 19 states make party switching difficult, led by New York, where party switching for the September 11 primary was closed on October 13, 2017! In anticipation of consideration of the report by the 447 members of the DNC, who are to meet the March 8–10 in Washington, Our Revolution has launched a nationwide petition drive that declares: “The [DNC’s] Rules and Bylaws Committee has the responsibility to implement these recommendations without alteration, in accordance with the DNC committee members and Chairman Tom Perez.” Activists are contacting DNC members—via state parties and with lists that are available online. Congressman Ro Khanna (D-CA) has begun urging Democratic members of the House—a number of whom are DNC members—to declare their support for the reforms. “[If] they want unity, they need to approve what the Unity Commission has recommended,” says Khanna.